We placed our cut-away stabilizer in the hoop. Then took our batting and quilt material (all the blocks including the cut-away, batting and material were cut little bigger than what we planned our blocks to be), placed it on top of the hooped stabilizer and pin it to the stabilizer. We embroidered the designs on top of the material and the stabilizer. Just be very careful. This method cannot be used for designs that are very dense. 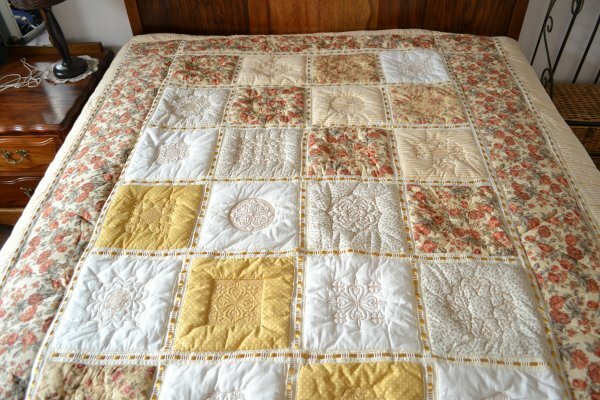 Once finished with all the blocks and before constructing the quilt we marked all the blocks and cut them straight into squares. 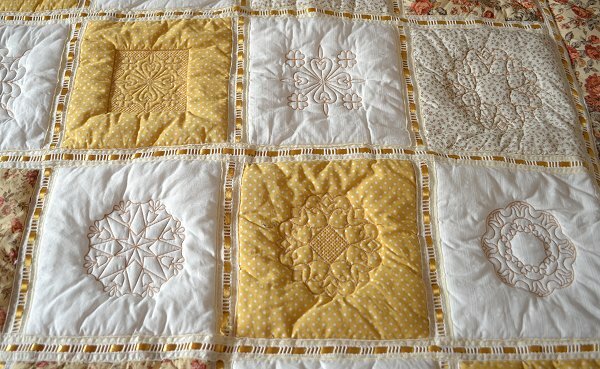 We used ribbon insertion lace with golden satin ribbon to join all the blocks.